Sometimes I debate scheduling messages to post over Shabbat. I worry that I’m sending the wrong message about Shabbat, that I’m encouraging people to use the computer or to work on the holy day. However, this blog isn’t for the talmid chacham (the person very wise in the life of Torah.) I like to have something scheduled to post for the person who is alone and lonely over Shabbat, and for the newcomer to Judaism who isn’t organized for Shabbat quite yet. Maybe Shabbat has been working on your heart to bring you to look for Jewish content during this time, or maybe you know it is Shabbat and you’re interested and don’t know what to do. And of course, some of you will find it after Shabbat is over, and that’s fine too. Feel free to browse around. I’ve got some messages marked “Especially for Beginners.” Or use the search box on the right to search for “beginners.” Just make yourself at home. I hope that you have a blessed Shabbat, whatever that means for you right now, wherever you are in your own personal Jewish journey. You’re welcome here. Posted on August 21, 2015 June 22, 2017 Categories ShabbatTags Sabbath7 Comments on A Post During Shabbat? I do not remember the last time I was this desperate for Shabbat. This has been a dreadful week, beginning with the bombing of the finish line at the Boston Marathon. Even though I did not know anyone present, the images that came streaming at me from the television, the computer, and even my smartphone were pixillated nightmares. Even though I was nowhere near Boston, have only been to Boston a few times in my life, it felt personal. I got angry, and made an appointment for a blood donation. I needed to act, rather than simply stew in stress hormones. Random bits of horror in the news kept poking at me: ricin, the Senate’s choice about the gun loophole, news about local violence. It seemed to never stop. Then, Wednesday night, when I got in my car at 9:30 pm after a class, I turned on the radio and learned about the factory explosion in West, Texas. A dear friend is the rabbi in Waco, just 20 miles distant, and I had no idea where she actually lives. I worried about her until she posted on facebook that she was OK.
That relief lasted only a few minutes, when the other details about the disaster began to sink in: 5 city blocks destroyed in a tiny Texas town. Volunteer firefighters were probably trapped in the exploding factory. Why was there a nursing home across the street? Why schools nearby? I donated blood. This, I can do. Then late last night, after another class, more violence, more weirdness, in Boston. I turned off the electronics and cleaned house. I thought about my sermon for this evening. I kept forgetting and turning something back on – and would turn it off again, because honestly, I’d had enough. Douglas Rushkoff‘s new book, Present Shock, describes what has been going on with me this week. Events come pouring in faster than we can process them. Narratives fracture before they are even formed. Conspiracy theories multiply and divide. Email, facebook, twitter, the radio, the news, the news, the news demand my attention and in a bad news week it WILL make me crazy. Of course, I had to start all over again this morning, wake up to more strange “breaking news” un-narrative from Boston, along with assorted bits nearer to home. The people in Texas seem to have dropped off the news cycle, which sort of worries me – will anyone remember to check on them? But today, at sundown, Shabbat will come. I don’t know if she’ll be wearing bridal white or a nice nurse’s outfit this week, but she will come and gather us in her arms. The electronics will be off. The buzz will be busted for a while. We will catch our breath. We will gather our strength. Blessed are you, O Holy One, Ruler of Time & Space, Master of the Now, Maker of Shabbat. Posted on April 19, 2013 April 20, 2013 Categories A California Jew, Jewish Time, RantsTags Douglas Rushkoff, Present Shock, Sabbath, ShabbatLeave a comment on Time for Shabbat, already! Finally, it is fine to ask questions about the prayers, the food, or the objects you see. Some things (a kiddush cup, for example, or a recipe) may come with family stories. 3. DON’T WORRY ABOUT HEBREW. There may or may not be Hebrew prayers or songs in Hebrew. If you feel awkward just listening, you have the option of saying “Amen,” at the end of prayers. As for singing, if you don’t know the words, you can tap your feet, or clap your hands, or just listen appreciatively. The dinner may begin with candlelighting and blessings over wine and bread. If you are not Jewish, you do not have to participate, just listen quietly and observe. Don’t worry that you do not speak Hebrew; many American Jews do not. It is a wonderful thing to learn Hebrew, but no one expects you to know it at your first Shabbat dinner! 4. COMMUNICATE! Shabbat dinner is not just about food. It is also about taking time to enjoy one another’s company. Treat each person at the table as if you expect to learn something important from them. Contribute to the conversation when you have something to say. 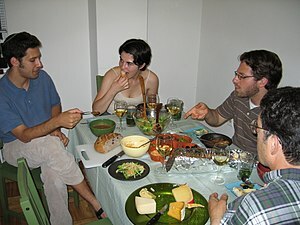 In many Jewish households, friendly dispute is welcome at the table, but do keep the tone friendly! Off color jokes and off color language are out of place at the Shabbat dinner table. 5. SAY THANK YOU. Write your host afterward and thank them for including you. 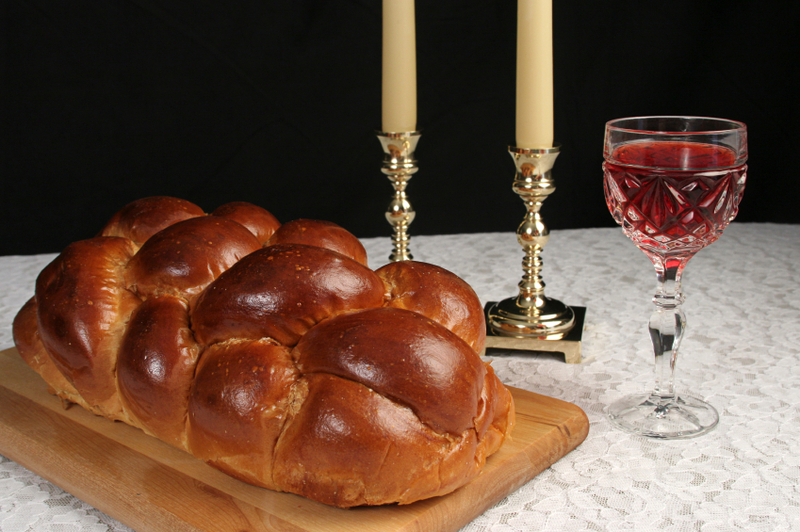 When you host your own Shabbat dinner (or a similar event from your own tradition) return the invitation!